1. Stand hip width apart. 2. Assume a neutral position of low back. 3. 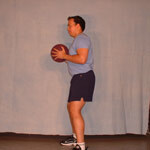 Hold a medicine ball in your hands close to your chest. 1. Draw belly button in and bend knees to 20 degrees. 2. Hinge forward maintaining neutral position of back and neck. 3. 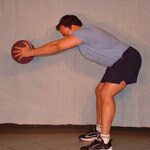 As you descend push ball out till arms are straight. 4. Return to start position bringing arms back in. Keep rib cage lifted throughout. Bend only as far as you can keep neutral position of the low back.